I have to give this adorable, romantic comedy 4.5 ♥'s. Contessa Von Hellengaard starts as a self-absorbed, high-and-mighty witch with a feisty temper. While you hope that she gets what she deserves, you can't help but connect with her as she finds herself in a situation ridiculously well suited to her needs. Along with her familiar, Jinx, Tessa finds her life weighing in the balance and coming up short. The timely intervention of her coven, led by her Aunt Trudy, starts Tessa through a masterfully designed obstacle course that opens her eyes to her true fate. The characters are well developed and enjoyable to watch as they grow and change. While this is a novella, it is the perfect size. Caroline Mickelson has a great sense of timing, humor, and irony. This fast paced story takes you where you need to go. 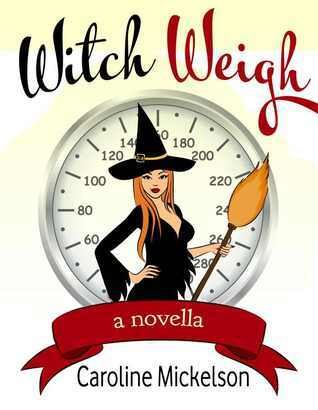 If getting there is half the fun, Witch Weigh delivers a full serving. It is a delightful story that I would feel comfortable recommending to anyone. I'm definitely putting Caroline Mickelson on my "to watch" list.